The District of Columbia Real Estate Salesperson Exam is divided into two portions. The first portion is the real estate salesperson national exam. The second Portion is the real estate salesperson state specific exam. The national portion of the District of Columbia Real Estate salesperson exam is made up of 80 questions. In order to pass the exam, an examinee must answer 60 out of the 80 questions correctly to pass (75% correct). The time allowed to complete the entire District of Columbia Real Estate salesperson exam is 4 hours. 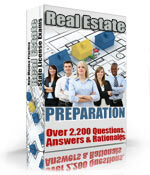 The state specific part of the District of Columbia Real Estate Salesperson Exam is made up of 30 questions. An examinee must answer 23 questions correctly to pass (75% correct). The time allowed for the entire District of Columbia Real Estate Salesperson Exam is 4 hours. In the District of Columbia, if you pass one part of the Real Estate Salesperson Exam, you are permitted to retake only the part you failed. The District of Columbia Real Estate Salesperson exams are taken by computer. The test is closed book. You are permitted to bring a simple functioning calculator for the 10% of the test questions that involve math. Remember to bring two forms of ID. Also, bring your reservation confirmation number, and any education verification. Review the candidate handbook with the link above to make sure you have the correct documents on exam day. Try to arrive at least 30 minutes early. The registration fee to take the District of Columbia Real Estate salesperson exam is $61.50.